Can you switch payment Gateways? We accidentally set up a form using the wrong payment gateway. Is there a way to switch it to Paypal without recreating it? Unfortunately, it is required to delete the existing payment field on the form and add a new payment field. 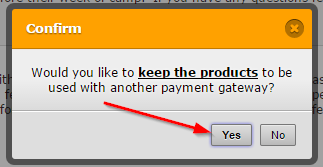 However, it is not necessary to configure all the products again in the new payment wizard by clicking on Yes when it is prompted to keep the products. Also, please be noted that if you have received any submissions using the existing payment method, the field information will be lost when you delete the field. You may be need to take a backup of the existing form submission data. Hope this information helps! Let us know if you need any further assistance. We will be happy to assist.